Réf. 2984 - A visiter rapidement ! Réf. 2893 - Atypique ! ABBEVILLE PROCHE DES GRANDS AXES MAISON DE CONSTRUCTION TRADITIONNELLE SUR SOUS-SOL COMPLET HALL D'ENTREE - VASTE SEJOUR / SALON AVEC CHEMINEE INSERT - COULOIR DESSERVANT SALLE D'EAU - WC - UNE CHAMBRE AVEC SALLE DE BAINS PRIVATIVE. A L'ETAGE : BUREAU - DEUX CHAMBRES -WC. GRANDE TERRASSE - GARAGE - SOUS SOL AVEC CHAUFFERIE - CAVE - CELLIER - GARAGE - PARKING EXTERIEUR. CHAUFFAGE CENTRAL L'ENSEMBLE IMPLANTE SUR 1740 M² DE TERRAIN CLOS ET ARBORE; A DECOUVRIR VITE ! AU COEUR DU CENTRE VILLE L'AGENCE ABBEVILLE IMMO VOUS PROPOSE CE BEL APPARTEMENT EN RESIDENCE DE STANDING AVEC ASCENSEUR OFFRANT: ENTREE AVEC PLACARD - SEJOUR DONNANT SUR UNE GRANDE TERRASSE BIEN EXPOSEE AVEC VUE SUR PARC - CUISINE AMENAGEE ET EQUIPEE - 2 CHAMBRES AVEC PLACARDS - SALLE DE BAINS - WC GARAGE - PLACE DE PARKING - CAVE CHAUFFAGE ELECTRIQUE BELLES PRESTATIONS ! 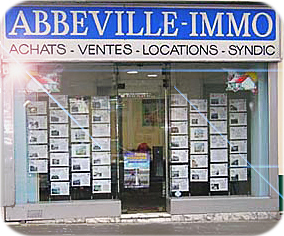 L'AGENCE ABBEVILLE IMMO VOUS PROPOSE DE VISITER CETTE MAISON SITUEE DANS UN QUARTIER CALME DE SAINT VALERY SUR SOMME ET A PROXIMITE DU CENTRE. IL S'AGIT D'UNE CONSTRUCTION TRADITIONNELLE QUI DEVELOPPE UNE SUPERFICIE DE 90 M² ELLE SE COMPOSE : D'UNE ENTREE DESSERVANT UNE CUISINE - UN SEJOUR - TROIS CHAMBRES - UN BUREAU - UNE SALLE D'EAU - WC UN SOUS-SOL SEMI ENTERRE AVEC GARAGE - LAVERIE -ATELIER. EGALEMENT DEUX PIECES AVEC ENTREE INDEPENDANTE - DOUCHE ET WC (POSSIBILTE D'AMENAGER UN GITE, OU MEUBLE, IDEAL POUR DU LOCATIF SAISONNIER OU RECEVOIR DE LA FAMILLE) COMBLE AMENAGEABLE - CHAUFFAGE CENTRAL LE TOUT SUR UN BEAU TERRAIN CLOS ET ARBORE DE 1000M². DU POTENTIEL ! A VISITER !